How do you see Scoliosis? A little bit about me. If you don’t already know, among many things, I have a degree in painting and drawing. When I danced professionally, I also sold my paintings in art galleries. The art critics said my art was very unique and was probably due to my dance background. The dance critics said my choreography was very unique and was probably a result of my art background. Not sure where the ‘unique-ness’ came from but I can tell you, that I am used to seeing things in a very different way. Long story to say, that when I see scoliosis, I see it as two things. First, I see it as completely normal. And second, I see it as an expression of living art. Scoliosis as completely normal. When I say I see scoliosis as normal, what I mean is that, in life, asymetry is normal. You won’t find anything symmetrical in nature: not a cloud, not a flower, not even one cell. In fact, the art of painting a portrait is about finding the asymmetries in someone’s face. Scoliosis, therefore, is just one more perfectly normal asymetry. Scoliosis as art. Scoliosis is an expression of the architecture of our very selves responding to forces that have been applied to our being. Whether those forces are internal or external a force was applied and a response was made and we are privileged to be able to see that response. Our bodies respond to forces everyday. Whether it’s a virus or a chemical or a fall, our bodies respond. Normally we don’t see, or can’t easily see the response to those forces. But in scoliosis, we see the response. It is an amazing vestige of the story of how easily our bodies managed the forces that were around us–and we had no idea it was even happening. Our bodies are exquisite works of art to begin with, but to be able to witness that response… Wow. That’s a masterpiece. The Scoliosis Masterpiece. So, now, what do we do with that masterpiece? I do feel lucky to see scoliosis as art and not an aberration. I would wish the same for you. But now, what do I do with my masterpiece of a spine? First I thank my lucky stars that I had a spine so willing and prepared to respond to the forces around it, then I do what I can to support it in its endeavours. The spine endeavours and strives to keep us upright. We know that because most of us with scoliosis are still fortunate enough to be standing. And not only do we stand, but most of us stand with our eyes level. This is quite an accomplishment considering the curves between the hips and the head. Striving for straight. Okay, so my spine is striving for straight or a more neutral alignment. Is there anything I can do to help? Well, in a nutshell, that is what Scolio-Pilates is all about. That is what I built Scolio-Pilates around: Simply helping the body to do what it is already doing, striving to maintain an upright position supported by position and strength. If you have any questions about getting started, Go here. 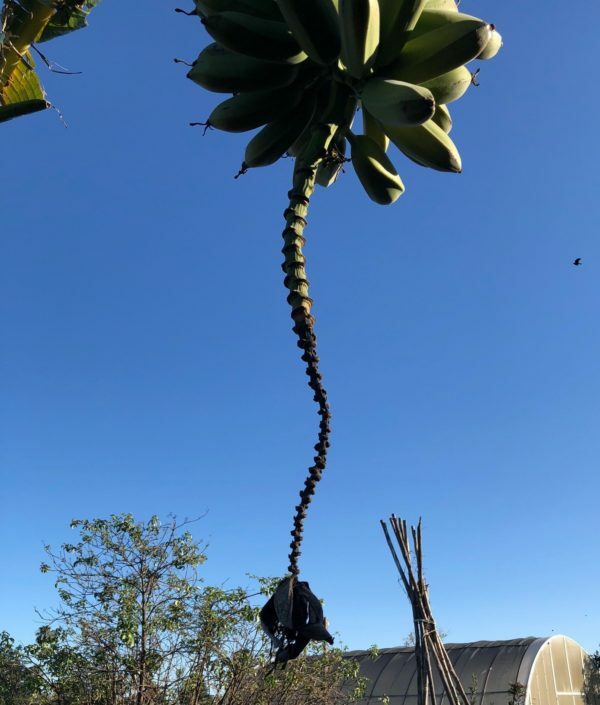 Photo credit: Don’t you love the Banana Plant? It’s a photo taken by one of our Scolio-Moms; Jenn Mislang. Thank you, Jenn! And if anyone else wants to send us examples of spirals in nature, PLEASE DO! Send them to Karena@osteopilates.com. Thank you!